Almo Nature - Cat - Anti-Hairball is tasty cat food which is available both as dry food and wet food. This food contains various ingredients that will help prevent the formation of hairballs in your cat. This food contains delicious meat or fish, so your cat will think the food is very appetising. Almo Nature - Cat - Anti-Hairball is tasty dry food and wet food for adult cats. This food consists of an optimal mixture of cellulose fibres, FOS (insulin), MOS and Yucca. These ingredients help to prevent the formation of hairballs and also promote the natural movement of hairballs through the digestive tract. This cat food contains either delicious meat or fish, so your cat is guaranteed to love it. This cat food is available as a wet food and a dry food, allowing you to choose which type of food is best for your cat! Chicken & Rice Dry Food: meat and animal derivatives (23% fresh chicken), grains (16% rice), derivatives of vegetable origin (0.5% fibre inulin of chicory - a source of FOS - 0.1%), yucca chidigera (0.1%), oils and fats, yeast, fish and fish derivatives, minerals, mannan oligosaccharides, eggs and egg products, seeds (0.1% linseed). Chicken wet food: Meat and animal derivatives (4% chicken), grains, vegetable protein extracts, derivatives of vegetable origin (0.1% inulin), minerals. Beef wet food: Meat and animal derivatives (4% chicken), grains, vegetable protein extracts, derivatives of vegetable origin (0.1% inulin), minerals. 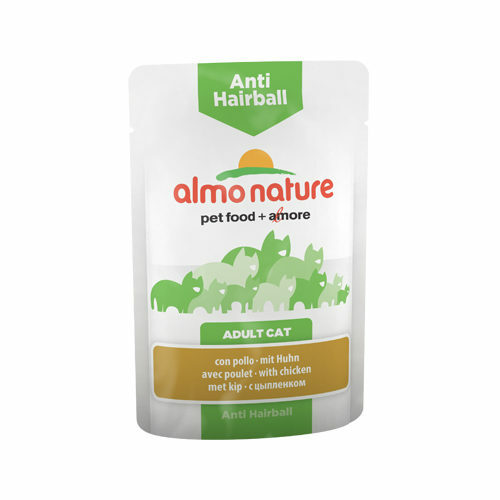 Have you used Almo Nature - Cat - Anti-Hairball before? Let us know what you think about this product.